As the most northern Island of the Canaries, Lanzarote lies only 70 miles from the west coast of Africa, yet it is under 4 hours flying time, which makes Lanzarote an ideal venue for a short break or longer relaxing stay. With breathtaking scenery, wonderful beaches, its extraordinary lava fields at Timanfaya National Park, all year round sunshine, why not join the growing number of visitors who have discovered this beautiful island with it's large variety of attractions, which offers a unique history and most fascinating culture. Playa Blanca, originally a small fishing village, now the third largest resort on the Island, yet it still remains very peaceful with the most wonderful views of Fuerteventura and the small island of Los Lobos. Situated on the most Southern tip boasts the best climate of all the resorts. The harbour is still very active, still retaining the charm of the local fishing industry, marina and the many ferry crossings to Fuerteventura taking approx 40 mins. In the Town, Playa Blanca has many excellent restaurants, very reasonably priced, plenty of shops selling local gifts and up market clothing, Tax Free goods etc., in a well laid out pedestrian shopping centre. The beach front has plenty of good bars and live entertainment in a tasteful setting. 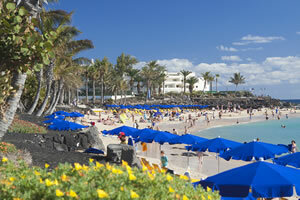 Lanzarote relies on and appreciates the tourist business. The local council has invested millions of Euros in creating a superb promanade and coastal walk which stretches some 5 miles, from the lighthouse at Pechiguera Poir Colorades via Playa Flamingo to the unspoilt Papagayo Beaches taking in some spectacular breathtaking views along the five sandy beaches in the area. Some of the amenities of the town include, banks, currency exchange, doctor, chemist, car rental, cycle hire, church, Wednesday market, petrol station, police, taxis, telephone, tourist information and for football fanatics Sky TV in Punto Limones Commercial Centre  adjacent to the Harbour.